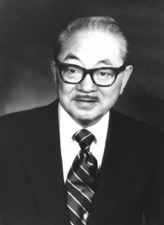 HAYAKAWA, Samuel Ichiye, a Senator from California; born in Vancouver, British Columbia, Canada, July 18, 1906; educated in the public schools of Calgary and Winnipeg, Canada; received his undergraduate degree from the University of Manitoba, Winnipeg, Canada, 1927; graduate degrees in English from McGill University, Montreal, Canada, 1928 and University of Wisconsin, Madison, 1935; psychologist, semanticist, teacher, and writer; instructor, University of Wisconsin 1936-1939 and at the Armour Institute of Technology 1939-1947; lecturer, University of Chicago 1950-1955; professor, San Francisco State College 1955-1958; president, San Francisco State College 1968-1973, becoming president emeritus in 1973; columnist, Register & Tribune Syndicate 1970-1976; elected as a Republican to the United States Senate in 1976, and subsequently appointed on January 2, 1977, to fill the vacancy caused by the resignation of John V. Tunney, and served from January 2, 1977, to January 3, 1983; was not a candidate for reelection in 1982; was a resident of Mill Valley, Calif., until his death in Greenbrae, Calif., February 27, 1992. Scribner Encyclopedia of American Lives; Hayakawa, Samuel I. Language in Thought and Action. 1938. Enlarged ed. New York: Harcourt Brace Jovanovich, 1978.